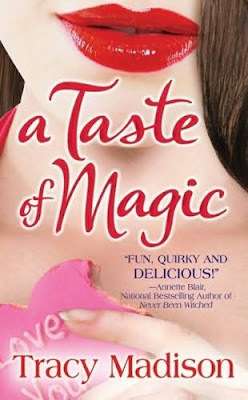 A Taste of Magic was a fun quick book to read. All I can say is this... if anyone knows of an actual magical gypsy baker could you send me her card? I sure I could use some magical baked goods. Who am I kidding? Some regular baked goods would be fine too. Elizabeth Stevens is one bite away from happiness. Today is Elizabeth Stevens's birthday, and not only is it the one-year anniversary of her husband leaving her, it's also the day her bakery is required to make a cake--for her ex's next wedding. If there's a bitter taste in her mouth, no one can blame her. But today, Liz is about to receive a gift. Her Grandma Verda isn't just wacky; she's a little witchy. An ancient gypsy magic has been passed through her family bloodline for generations, and it's Liz's turn to be empowered. Henceforth, everything she bakes will have a dash of delight and a pinch of wishes-can-come-true. From her hunky policeman neighbor, to her gorgeous personal trainer, to her bum of an ex-husband, everyone Liz knows is going to taste her power. Revenge is sweet...and it's only the first dish to be served.